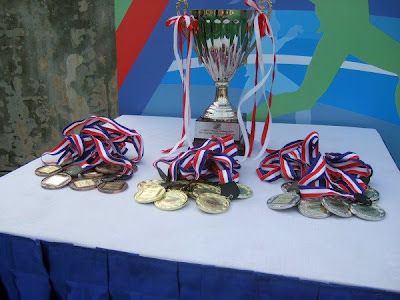 The trophy is named after the GOH - A/P Ho Peng Kee, the Senior Minister of State for Home Affairs and Law, who is also one of the two advisers of the FAS. 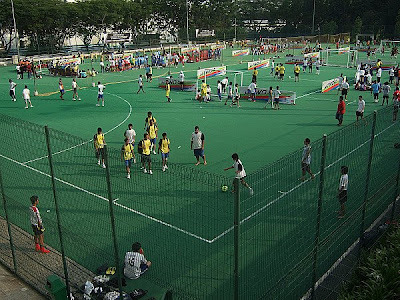 A total of 104** teams took part in the futsal competition of the "H-Two-O Ultimate Challenge" held at the Nanyang Polytechnic (NYP) campus at Ang Mo Kio. 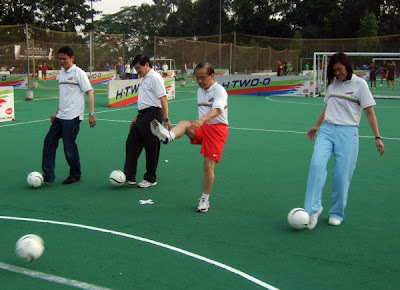 According to the organizers, this figure of 104 had set a new record in the Singapore "Book of Records" for the largest number of teams taking part in a futsal tournament held in Singapore. This event was held in effort to raise fund for the Jamiyah Children's Home. 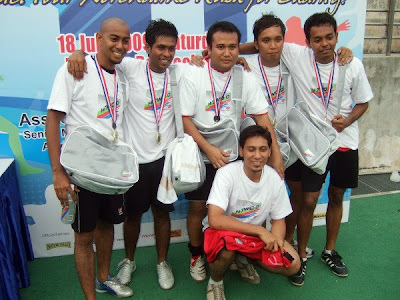 Met a friend, Daniel (pictured above, second from the left) who was there with his group of "kakis" taking part in the event. 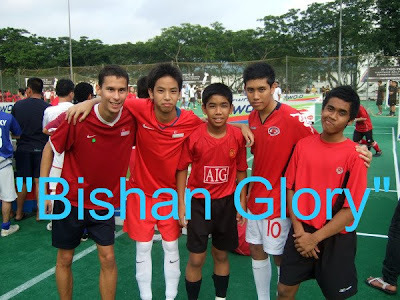 Called themselves the "Bishan Glory", the group of five had known each other for more than four years and been playing the game regularly in their usual hangout where they live (Bishan, of course). While this team (pictured above) called themselves "Sims" which initially I thought they named the team after the "Sims Family", only to realize they are associated with SIM, the educational institute, instead. 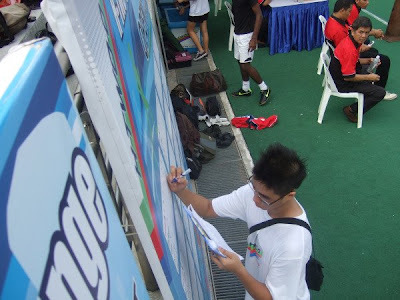 Other than those groups formed by the "weekend warriors", there are also various S.League clubs represented by their COE teams. 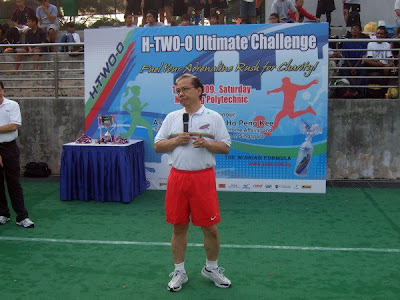 A/P Ho (pictured above) graced the occasion and urged all to support all levels of football in Singapore, which had achieved quite a lot during his tenure as the president of FAS before stepping down earlier this year. Ms May Ngiam, VP for Markerting of Yeo's (pictured right above) presented a token of appreciation to A/P Ho following his opening address. 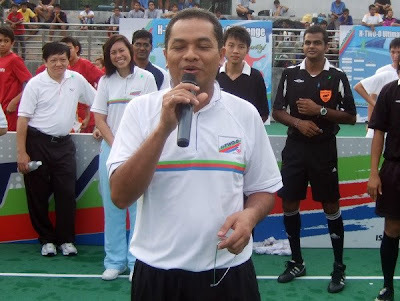 Mayor Zainudin Nordin (pictured above), the president of FAS also said a few words before the commencing of the futsal event. 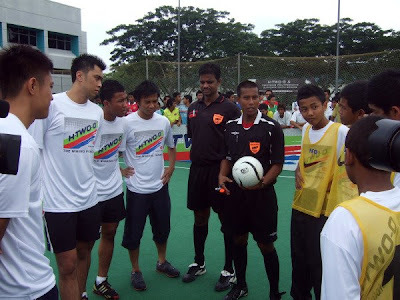 The referee brief the teams' skippers before the start of the matches. 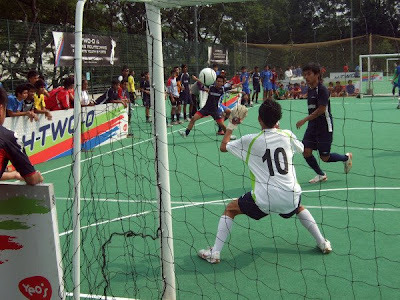 The hockey field of NYP was divided into four makeshift "futsal" fields for this event. The NFA boys checking out at the Group standings. While the Tampines Rovers' youngsters were warming-up themselves with the ground staff doing some patching up of the arch. 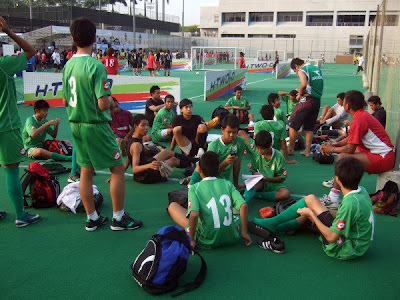 Geylang United's youth squad also made their presence felt. 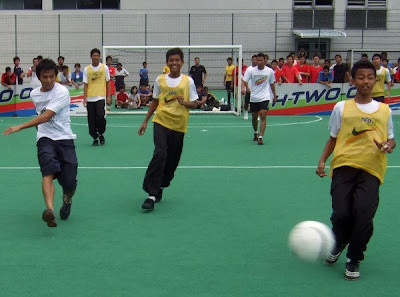 (Picture above) S.League footballers like Razaleigh Khalik, Lionel Lewis, Isa Halim and Indra Sahdan were also involved in this event, as they pit their skills against a group of boys representing the Jamiyah Children's Home (in yellow bib). 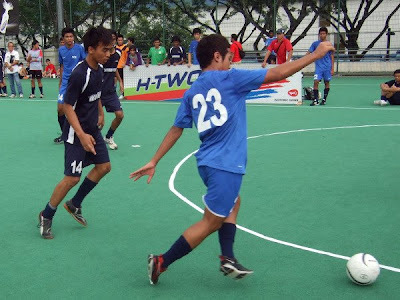 National skipper Indra Sahdan Daud, who is also a part-time student of NYP, showcase his striker's instinct in this friendly. (Picture above) "RV140" fought their way out of the 51 teams that took part in "Open Category" to clinch the honour. 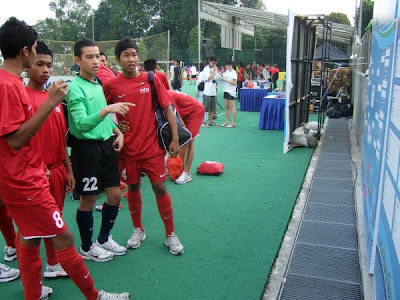 (Picture Above) The Tampines Rovers U18 "B" Team were crowned the kings of the "U-21" category. Ms Ngiam represented the organizers received the certificate, that confirmed the record-breaking feat, from the official from the "Singapore Book of Records". It's definitely not easy to organize such a big-scale event, but the organizers did a wonderful job to ensure everything was smooth-sailing and thanks to the complimentary "H-TWO-O" that worked its magic to ensure all involved were always remained hydrated under the scorching sun. Perhaps, further tweaking of the game's rules is necessary to encourage more passing plays and closer control of ball skills. As the disappointing part in some games was to see some teams' "kiasuism" in playing the ball to the opponents' half by having the goalkeeper making long throw into the opponents' arch hoping his teammate would "flick" in a goal (must be the fact that we are being Anglophile in football-sense). Players should refrained from taking "piledriver" unless necessary in futsal. As futsal should be a game more on "ground-play". 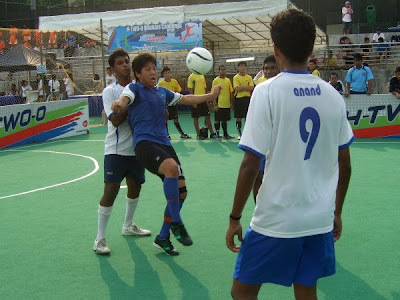 A place where players learn to develop close-control of the ball. How to work your way out of a tight situation in a confined space. Unless you are dead accurate with your shot (like this goal), not point whack the ball hard as it will go out of play and disrupt the flow of the game. Many thanks and appreciations to Ms Belda Chen of Yeo's for making this blog entry possible.